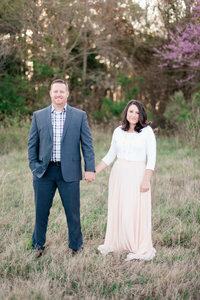 I am loving this Aberdeen Farm Engagement Session! These two will be getting married next year at this lovely venue in Smithfield VA. This was our first time at Aberdeen Farm and let me say even in the winter it is stunning! I loved all the land available to us and the water view is gorgeous! I can only imagine what this place looks like in the spring and summer! I love how her looked evolved throughout the session. I think my favorite was the lavender tulle skirt she stepped out in! Very glamorous and fun! We originally scheduled their session on Saturday. However, with the intense wind we have been dealing with we had to reschedule to Sunday. 10 am sessions are normally not the best time for sessions because of the direct light, but we worked with it and I am actually quite happy with the lighting in these pictures! So glowy and romantic! I love how these two interact together. The both of them are so comfortable and relaxed with each other. The way they laugh and joke lets you know that they are the best of friends. Luke and I had such a great time with both of them. We even took them on the farms personal runway and did some fun shots! Despite the wind it was still an awesome session and I am so glad we had the opportunity to meet these two. Thank you Ryan and Kelsey! You guys were so much fun and you both make one stunning and incredibly fun couple! And because we are in March… I just had to get a ring shot with a clover! Thank you to the generous and kind staff at Aberdeen Farm! You can see more of our awesome couples below!